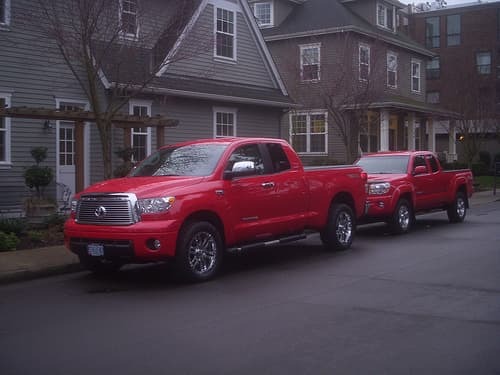 At the 2014 Chicago Auto Show, Toyota made waves with the debut of their TRD Pro Series packages for the 4Runner, Tundra, and Tacoma. On their website, Toyota calls the new series “the most capable, adrenaline-inducing lineup of off-road vehicles ever unleashed.” The TRD (Toyota Racing Development) team took their expertise with off-road racing to take the already off-road capable Toyota trucks to the next level. TRD has an accomplished history, with numerous major wins at off-road races like the Baja 500 and 1000. Whether the new TRD Pro Series package will allow off-road enthusiasts the total mastery over rugged terrain they want remains to be seen, but the packages certainly look promising. The trucks part of this elite extreme series will be available in Fall 2014 for an as-yet undisclosed price. Black, Super White, and Inferno will be the only color choices. The new Inferno – a fiery shade of orange – was the showcased color when the trucks made their debut. Trucks with the TRD Pro Series package are ideally suited for those looking for a vehicle with attitude that can handle some serious off-road conditions, while still offering all the quality and capability of the standard versions of the Toyota trucks. To show off their new bad boys, Toyota built an expansive off-road course at the 2014 Chicago Auto Show. The rugged course included steep inclines, rocks, and water obstacles, and the trucks reportedly handled the course with ease. How the trucks will respond in real off-road conditions is yet to be seen, but it’s certain that plenty are eager to give them a try. As Toyota surely hopes, the TRD Pro Series package trucks may give the Ford SVT Raptor a run for its money in the race for the toughest off-road truck. Also in this race are the Ram 1500 Outdoorsman and the Chevrolet Silverado Z71.